There’s no ‘official’ way to do this in ConvertKit, so I’ve got 3 nice workarounds for you. If you have a banner/header image in your email template, you can give the banner a title (aka ‘alt text’). This would show ‘ConvertKit Club’ as the preview text, instead of the banner url. This works for both banners in email templates and when you upload an image at the start of an email. 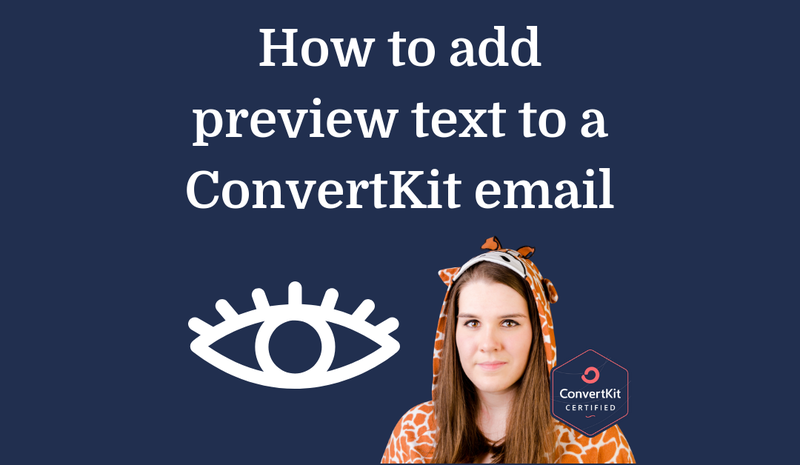 (The limitation of this is that you’ll have the same preview text for every email). So they would see PREVIEW TEXT GOES HERE as… the preview text! Firstly, switch to the html view of your email. So again, they would see PREVIEW TEXT GOES HERE as… the preview text! Whatever you have in a custom email template will take precedence over what you have in the email. e.g. If you use Option 2 and Option 3. Both will show in the preview text, but Option 2 text will show first. Unless you’re super particular, I would recommend setting something up and then forgetting about it (like I have with the ‘This email is really good!’). Life is too short to fiddle about with preview text every time you send an email! Please do let me know in the comments how you get on and if you think up any fun things to write! …and that I understand them!